From an early age I loved being on my grandparent’s farm. I knew that I wanted to work with cattle and other farm animals. This is the story of the farm. I have very fond memories of the Proctor Farm from when I was little. I spent many a pleasant time playing with and feeding the calves that were on the farm. I would spend many a happy time there. I just knew that this would be the life for me. My grandpa Proctor would let me ride the tractor with him. Something like that is not done very often in today’s world. The farm was not very big in today’s standard, it was 88 acres of mainly grass fields. 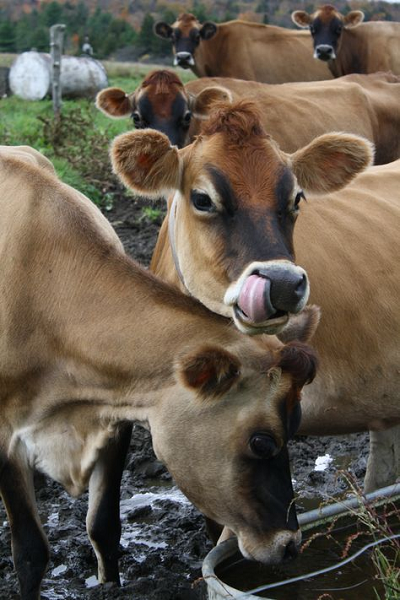 The farm was milking Jersey cows at the time, if my memory serves me right. 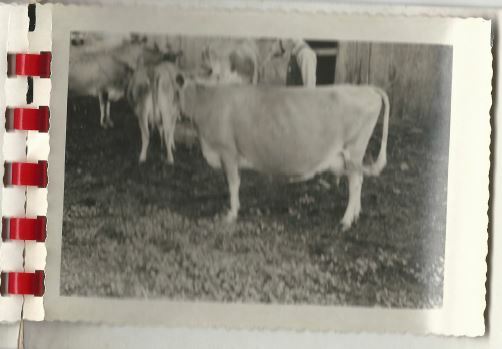 These cows where probably crosses, but I remember that the milk had a high butterfat content so they were probably Jersey cattle. This is when I first learned how to milk by hand with my grandma. The cattle would come to the barn, if they were not already in line waiting to come in. Being anxious to be milked. The milk cows knew which stanchion to go to and we would move the board over and place a block to keep them in place. With a little corn meal, they were as happy as could be. Then we would place the milkers on the teats after they were cleaned and the suction would pull the milk down into a receiver tank that hung below the cow. Sometimes we would need to put kickers on their shanks if the cow was known to kick. 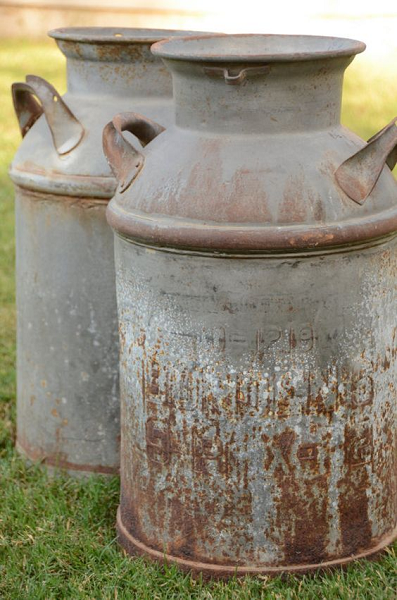 The milk receiver tank that hung on the cow would be removed and poured into a milk can, which would then be placed into a cold-water tank to be chilled till the milk truck came and picked the milk cans up. 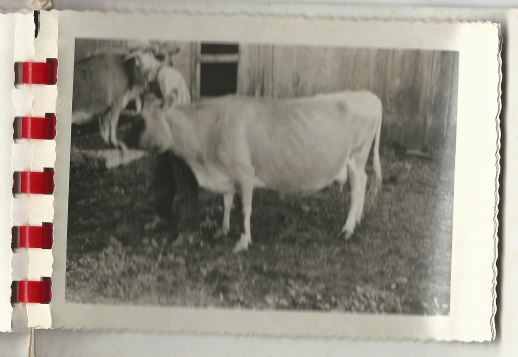 When milk was needed just for the house, grandma would sit on a one-legged stool and hand milk a cow into a milk bucket. The barn cats would come around and grandma would squirt milk right into their mouths. The milk would be taken to the house and poured into glass milk containers. As the milk chilled you would see the cream rise to the top. Most of the time that would be taken off to make butter with or to use for cooking. We would drink the milk in colored metal drink cups. You would see the fat globules line the side of the cup as you would drink the milk. It tasted great. My mom would tell me that I did not have to drink the milk, because it wasn’t pasteurized. That did not stop me, I always drank it anyway. I would also help with gathering eggs with my grandma. We had a hen house that we would walk into to get the eggs. The hens would lay their eggs in straw, that was in boxes, elevated and attached to the walls. 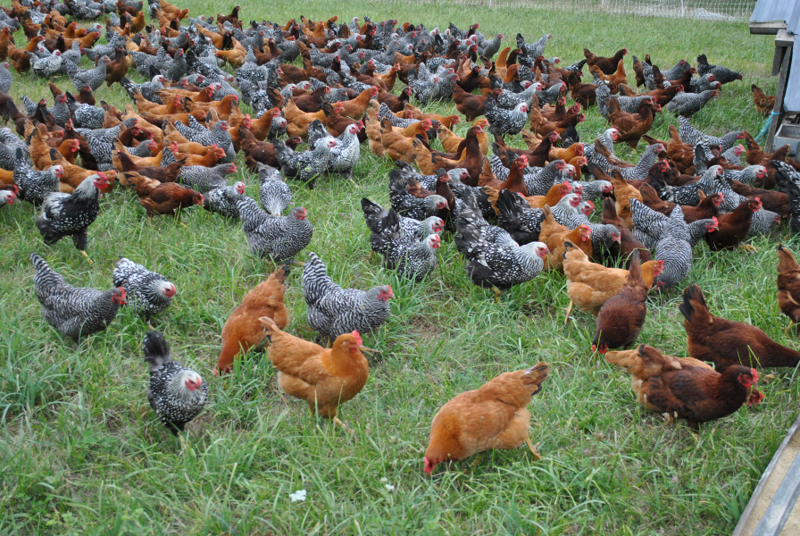 Most of the time they were out in the yard or pasture eating bugs while we gathered eggs. My grandparents would raise a few hogs for butcher. I can still remember grandpa calling the hogs to feed by a long “suueeee” , and they would come running to the slop. They would kill and butcher the hogs on the farm. I still have the knife that my grandpa used for this. Unfortunately, I never did get to help with the butchering. The farm had some fruit trees that grew not very far from the house. I can remember cobblers and pies being made from the fruit grown on the farm. Next to the farm house was a very large garden that my grandma would tend. She would grow sweet corn, tomatoes, potatoes, green beans and other vegetables. Grandma would can the excess vegetables for the larder which was located in a dugout basement under the house. It was always cool down there and canned goods would keep really well. Grandma use to make the best tomatoes juice I ever drank. It was probably the best because it was so fresh. When I was real little grandma would give me a bath in a wash tub that was set on top of the kitchen table. Too little to be modest or to care. The water for the bath and for drinking came from a cistern. I would help get water by turning a crank that would raise water up from the well. The cistern was located just off the kitchen in the enclosed mudroom porch. In early years we would have to use the outhouse if we need to go to the bathroom. The barn also had a cistern for the livestock. The water would runoff from the rains and be collected in the cisterns. 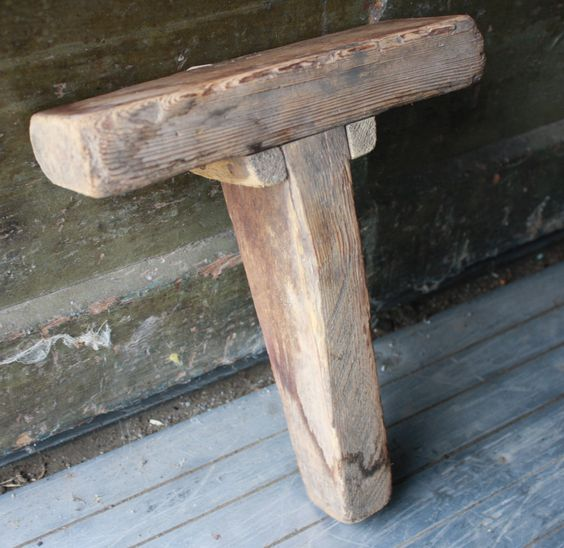 The barn had a more traditional handpump that would raise the water from the wells to a watering trough. My grandparents dug the cistern wells themselves. My entertainment would be to follow my grandparents around and pretend I was them, follow the cattle as they grazed and watch the clouds make formations. At night you could see a matt of stars, the milky way. They did not have light pollution back then. My grandfather died. That made things really hard on my grandma. 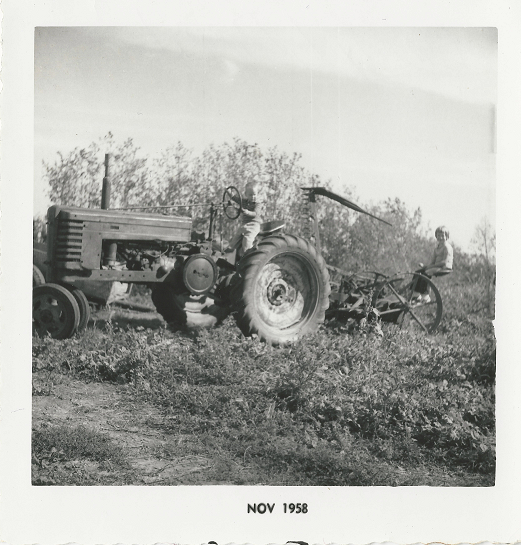 To be honest, my grandma worked harder on that farm than my grandpa did, but this still put a huge burden on her. As she grew older it became harder for her to manage the farm. My dad and my aunt decided to sell the farm. That farm was supposed to be my inheritance, but not to be. Seeing the farm auctioned off was one of the hardest things I have ever watched. My dad told me that if you have enough money to farm, then why would you. The farm was sold to a neighbor that wanted the land because it was next to his. The old farmhouse, barn, ponds, fencing, everything was bulldozed down. The new owner built a new fancy farm house where the old one had been. If not for memories, one would have never had known the Proctor Farm had ever existed. But the desire to farm was still in me, I had a dream.